SLS Las Vegas Casino Bar. I hate renderings. I’m heading out to SLS Las Vegas in a couple of hours and will share pictures and info from the press conference and property tour on twitter and instagram. In the meantime here are a couple of PR videos to show and tell you about the newest hotel on the Vegas Strip. SLS Las Vegas Property Tour – Shows what the casino, restaurants and rooms look like. This video is actual footage of SLS Las Vegas (thankfully) and not a crappy rendering video. The audio was wonky for me so crank up some jams, it’s 4 minutes long. Sound bites from SLS Las Vegas Partners: Sam Bakhshandehpour, Philippe Starck & Jose Andres talk about their excitement for the property. I didn’t watch this video because I don’t need to hear how excited they are and how this will change Las Vegas forever. 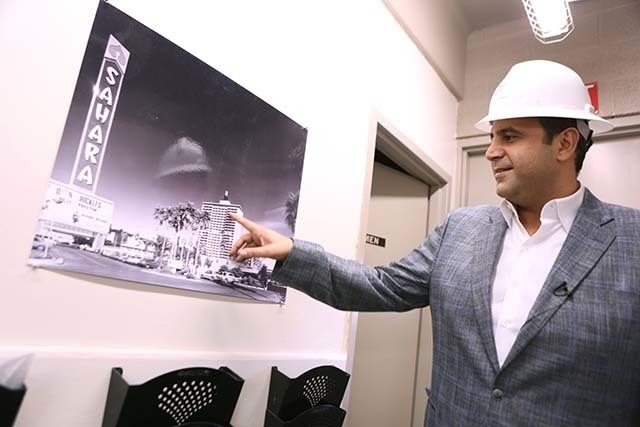 At a licensing hearing for SLS Las Vegas a couple of weeks ago it was noted that Sam Nazarian’s SBE only owns 10% of the hotel opening this week. Stockbridge owns 90 percent of the SLS Las Vegas while SBE Entertainment owns the remaining 10 percent but does not have any voting rights. This surprised and confused many people as Sam Nazarian has been touted for “Shaking Up Las Vegas” since SLS Las Vegas was announced. 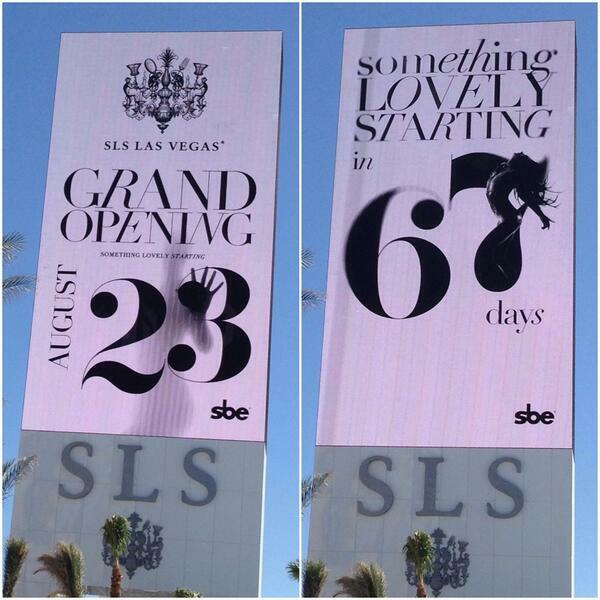 In just three months, on August 23, Life will open as the centerpiece of Nazarian’s new SLS Hotel and Casino. It’s where rowdy bachelorettes and drunk conventioneers will buy $1,000 bottles of champagne while aerialists perform overhead. Yes, SLS Las Vegas is being touted as Sam Nazarian’s hotel despite his company’s small ownership stake. As I’m writing this there’s a hearing for SLS Las Vegas’ gaming license where it was clarified that SBE/Nazarian “work for Stockbridge” and that technically Rob Oseland will really be running the ship day to day at SLS Las Vegas..
Sam Nazarian is a figurehead and spokesperson. He’s the famous name that SLS Las Vegas can use to market itself. In today’s media landscape this small ownership stake by a spokesperson should come as no surprise to anyone. Jay-Z owned less than 1% of the Brooklyn Nets when he was called an owner. Magic Johnson owns the Los Angeles Dodgers but owns less than 3% of the team. Even though calling these people “owners” seems like false representation it isn’t. They are “owners” hired as spokespeople. Jay-Z (especially) and Magic Johnson bring a cool factor and little more to their businesses interests. This arrangement benefits both parties as it offers something neither would have without each other. Nazarian and SBE offer almost the same thing to SLS Las Vegas but they actually bring some kind of business portfolio to SLS Las Vegas. That’s probably why they own 10% and not less than 3% of the business. 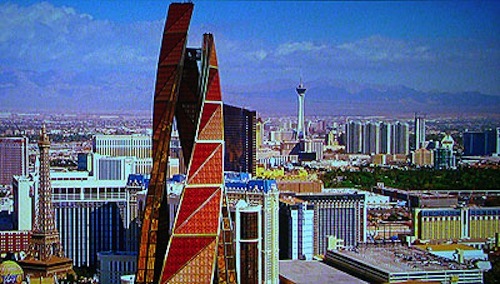 In Ocean’s 13 Willie Bank wanted to have the most fabulous casino that Las Vegas has ever seen. He wanted a higher form of luxury than any other hotel offered. 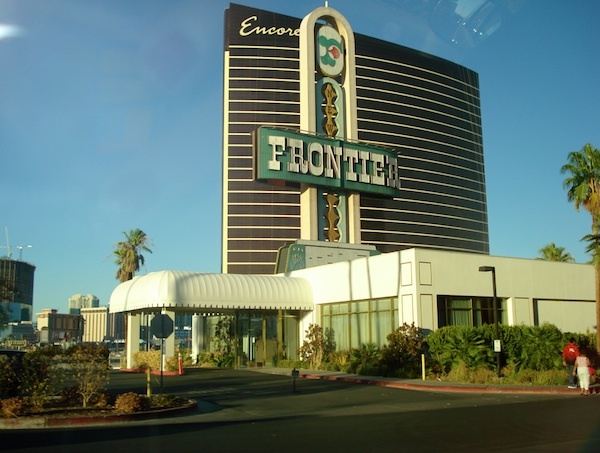 From early interviews it seems as though James Packer and Crown Holdings might have the same idea for the hotel and casino to be built on land where the New Frontier once stood across the street from Wynn. No specific plans have been announced for the hotel (not even a name) but everything in this interview with Australian Financial Review can easily lead you to believe this new casino and hotel will be top of the line luxury. Andrew Pascal says a Crown Resorts-backed development in the gambling city will draw new Asian punters and deliver a luxury experience that will not be matched by incumbent players – including his old employer. Pascal’s former employer was Wynn so he knows a thing or two about luxury in Las Vegas. The focus on Asian customers is a direct shot at Wynn’s customer base. Wynn typically has the second highest room rates in Las Vegas and Wynn is also among most profiable casinos on the Vegas Strip. It will be interesting to see if Crown can build a property that suits their high end international customers. Wait, more shots fired at Wynn and the other luxury properties in Las Vegas. Crown and Wynn have two of the three Five-Star hotels in Macau and Crown plans on bringing that Asian luxury to America. “We think we get luxury, we think we get service and we intend to cap­italise on that and bring that sense of hospitality to Vegas, with an Asian ­sensibility,” he (Todd Nisbet) said. Resorts World Las Vegas is being planned as a family oriented property. SLS Las Vegas will be “affordable luxury” (read as cheap but nice). It will be nice to have another luxury hotel and casino in Las Vegas. I’m looking forward to seeing detailed plans on what Crown, Packer and Pascal have in store for this hotel. Ocean’s 13 is a great movie. It’s on TV often but if you want it on DVD you can grab it for under $7 at Amazon. Almost a year ago it was rumored that James Packer would be buying the Cosmopolitan of Las Vegas. Like many rumors in Las Vegas that turned out not to be true in the end. Packer might have been sniffing around Cosmo but didn’t end up making the purchase. Earlier this year the Cosmopolitan was sold to Blackstone. Last week rumor had it that James Packer wasn’t done with Las Vegas when Bloomberg reported that James Packer is seeking a return to Las Vegas. Late last night and this morning those rumors were confirmed as James Packer purchased the land across the street from Wynn and Wynn and Encore. Australian billionaire James Packer said he has acquired controlling interest in a nearly 35-acre Strip land parcel and will form a company to build a hotel-casino on the site with former Wynn Las Vegas President Andrew Pascal and investment firm Oaktree Capital Management. James Packer and Crown Resorts have a pretty bad history in Las Vegas. If he was making this plan alone I wouldn’t think that this new development on the New Frontier land would actually happen. His partnership with Andrew Pascal says that development is possible. Pascal was previously President at Wynn and is very respected in the casino community. Details on what the property haven’t been released yet but they’re looking at a potential opening as soon as 2018. With the former president of Wynn involved it’s easy to guess the property will have good and fair gaming and will target a more upscale customer than average. I’d love to see more development on the north end of the Vegas Strip but, like SLS Las Vegas, I’ll believe it when I see it. I look forward to seeing what comes from this. The more casinos on the Vegas Strip the merrier! Like I said last time I wrote about him, I don’t care that James Packer is a scientologist it just makes for a fun headline and makes me giggle. 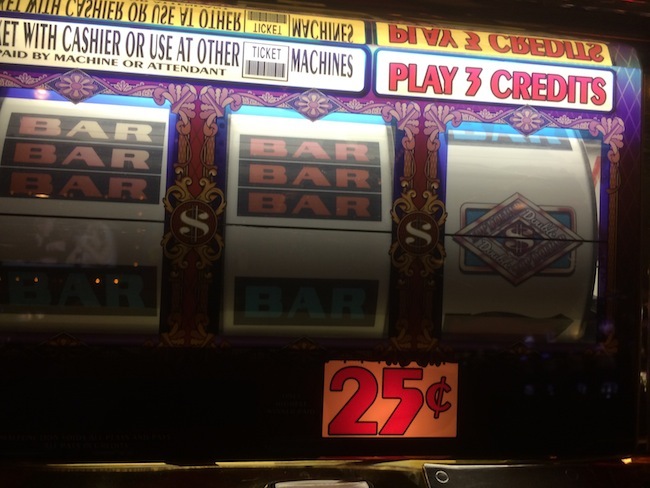 Over the years I’ve written about the original Top Dollar reel slot machines a lot. They’re by far my favorite slot machine and probably the game that got me into playing slot machines. Most 3 coin reel slot slot machines are boring but the loud and obnoxious bonus round totally fits what I like in a slot machine. Check it out. If you search Top Dollar slot wins on YouTube you’ll notice that many of the people playing Top Dollar are loud and kind of obnoxious – just like the game. And like the Top Dollar slot machines everyone is having fun. When I get a bonus (see photo above) I’ll usually throw my hands in the air and dance a little. When I was at Flamingo a few weeks ago I played this quarter game to start off my day of gambling. I like to ease into a day of gambling with a lower limits machine even though I prefer the $1 or $5 version of this game. I’m usually just not ready for human interaction and don’t like to risk much the first thing in the morning or afternoon. These Top Dollar reel slot machines are slowly disappearing from casinos. New casinos opening don’t want the older machines and older casinos don’t want to seem old. There are new versions of Top Dollar but they aren’t as fun. You won’t find this Top Dollar slot machine in the regular casino at Cosmopolitan or Downtown Grand and probably won’t find it when SLS Las Vegas opens. You may find Top Dollar in some of their high limits rooms though. You’ll also be able to find Top Dollar in larger casinos with sections of older machines like Flamingo or Mandalay Bay. Get em while you can! A couple of hours ago SLS Las Vegas tweeted a picture of their blackjack table. Besides having monkeys (awesome) it also states that this blackjack table will pay 3:2. As I mentioned in an article last month on Vegas Chatter the casino will have both 6:5 and 3:2 blackjack. The best news about the 3:2 blackjack game is that they say some will be low limits. This is rare for the Vegas Strip. I look forward to seeing what they offer when the casino opens. SLS Las Vegas announced that it will be opening a week early today and that’s a good sign for gamblers. Casino openings are usually filled with hype. I got sucked into that when Downtown Grand opened last year. There was a lot of over promising from Downtown Grand before they opened. Expectations were high from everyone. 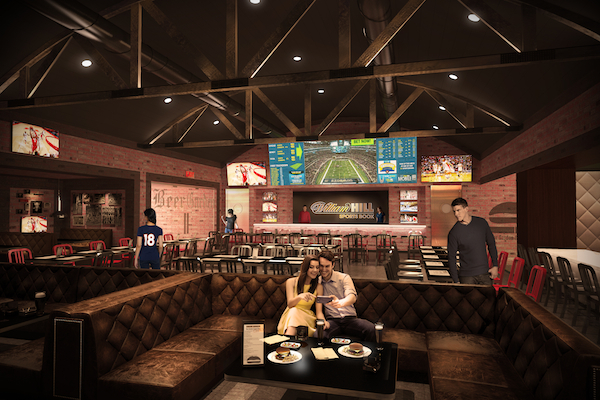 They promised more great dining options than anywhere else in Downtown Vegas. Instead they offered a food court with mediocre food, a sub-par cafe and a shave ice stand that may never open. Outdoor gaming was a great idea but 2 blackjack tables facing a wall with homeless people wandering the street behind is not ideal. Street dice is nothing like they described either. Besides outdoor gaming, Downtown Grand never talked about their gambling. Typically when a business avoids a subject there’s nothing good to say. Downtown Grand ruined Mob Bar by removing video poker and a great beer selection. In fact, all of their bars have sub-par beer options (see more at Vegas Chatter). Now it’s just where I park when I want to get chicken parm sliders. Downtown Grand under delivered on just about everything. I don’t hate them for it but Downtown Grand was poised to become my new Downtown Vegas home. SLS Las Vegas hasn’t promised much that doesn’t seem attainable. Affordable luxury sounds achievable. Many of their restaurants have outlets in LA so researching them on Yelp should give you a general idea of what to expect. SLS Las Vegas has promised one thing that we know little about. 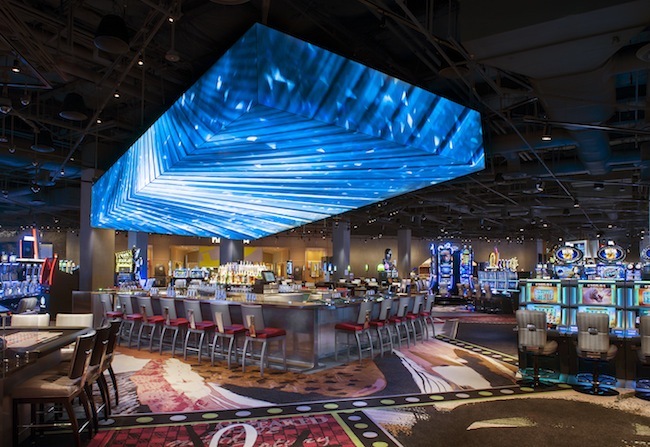 SLS Las Vegas has repeatedly said that the casino would offer gambling that locals would enjoy. This generally means good video poker, ample slot machines and good table game odds. I’ve been cautiously optimistic about SLS Las Vegas’ casino but I’m throwing caution to the wind and now I’m straight up optimistic. SLS Las Vegas Opening EARLY! That escalated quickly. SLS Las Vegas will be opening a week early. Opening date is now August 23rd. I can’t wait!